Fiverr is one of the most popular global online marketplace, offering tasks and services. Fiverr is used by the freelancers to offer service/task to customer of all over the world. Freelancers offer their service through Fiverr. It called �Gig�. Freelancer offer various types of Gig. The minimum Gig�s range is $5 USD and maximum range $500 USD. Fiverr gained Top 100 ranked popular website in U.S and Global rank is in top 150. Fiverr has million of gigs of clients and service providers. It is very user friendly to use. It is trusted and safety to deal with service providers or clients. 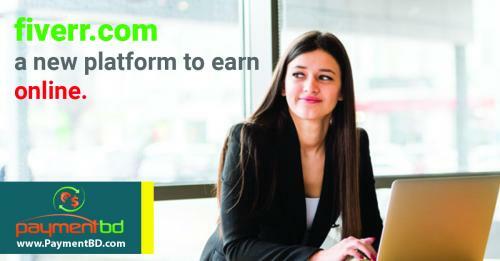 Lots of Bangladeshi freelancer is earning through fiverr.com . It accept PayPal and Payoneer Card and Bitcoin. You can receive paypal dollar from Bangladesh through PaymentBD.com . A lot of Bangladeshi fiver freelancers received Paypal dollar from Bangladesh through PaymentBD.com .